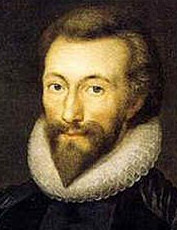 Notes on Selected Poems by John Donne. This set of Tower Notes is 318 pages long and is sold as a fully illustrated PDF file with footnotes and references. A free sample, text only, drawn from the beginning and middle of the notes is provided below. In The Ecstasy , the speaker explains to his beloved that they must ‘turn’ to their ‘bodies’ so that ‘Weak men on love revealed may look.’ In Donne’s Elegy XIX: Going to Bed , he writes in a similar vein of the way in which women are ‘mystic books’ denied to the ‘laity’ but who may be ‘revealed’ to those to whom they choose to impute that grace. Such a sense of revelation also lies behind the reference in The Good-Morrow to ‘our waking souls.’ Love for Donne is a wonder, a mystery, an extraordinary secret known only to the few, but something his poetry can help the reader to uncover and understand. Love in Donne reaches out into arenas of language that the reader may well find bizarre and inappropriate, but it is difficult to see how the expression of his ideas could be improved. How better to express the love celebrated in A Valediction: Forbidding Mourning that to align it with the geometric certainty of a Euclidean proof? Talk of new continents, and the maps that reveal them to the world, is simply a way of delineating a love that takes the poet into marvellous and unexpected new territories. Similarly, love can easily propel him through the heavens of Ptolemy’s cosmos, far beyond the ‘sublunary lovers’ love’ of his ‘laity.’ Equally, in more pessimistic mood, the movement turns inward, downward, through the concentric circles of alchemical speculation towards the spurious Philosophers’ Stone, that is ‘imposture all,’ but which provides a telling image of how love can be pursued recklessly as the panacea of all our ills.